Fiber drums feature different shapes and sizes. These fiber barrels are light-weight, ease of use, corrosion-free, and highly durable. No wonder a lot of businesses, including manufacturing and production companies, across the nation have chosen fiber barrels as the preferred container for storing, shipping, and containing finished goods and other product. Below are some benefits of using fiber barrels. While every business continues striving to deliver quality products and services, it is essential to keep finished goods safe and secure until they reach the final consumer. 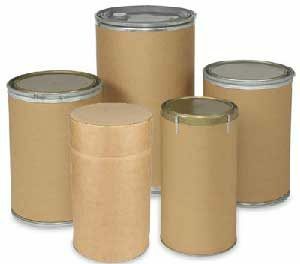 Fiber drums can help protect your products against scratched and other damages. Also, the majority of fiber barrels are made of fiberboard, with minimal metals, these drums are less likely affected by corrosion or rust. Hence, you can be certain that any product you store will such a corrosion-free container will not be contaminated by rust or corrosion. Each year, industries lose a huge amount of money to returns due to damaged goods. Fiber drums are designed to offer an ideal solution to this. The barrels can be manufactured with multiply ply constructions to offer enhanced protection against torque forces, external pressure, or collision, and can bear weight. What’s more, the interior portion of the fiber barrels feature telescoping and cover flush tape seal. This makes them very smooth. With a fiber drum, you can prevent scratches, damages, and deformation. No better way to cut your losses than this. In addition, fiber barrels are a totally green product. The barrels can be recycled and reused. As a results, they help to minimize environmental pollution. If you need an environmentally friendly storage solution that you can simply recycle or reuse, you can always opt for fiber drums. Lastly, fiber barrels are very easy to use. Opening and closing the drum is relatively easy. The drums also feature an adequate cubic filling space that can contain your items. The ease of use of the fiber drums makes dispensing products and filling up the drum more efficient and faster. Above all, you can easily arrange and stack the fiber drums together during storage or shipment. There you have it! Above are some of the benefits of using fiber barrels. Fiber drums are highly suitable for a lot of commercial operations like storing and shipping finished good. Contact us today at Youngstown Barrel & Drum. We have quality fiber drums for sale.